Med One Capital is dedicated to providing you with the absolute best in medical equipment, such as the 1900 from Tri-Anim, an oxygen/air blender that delivers accurate mixtures from two outlets. 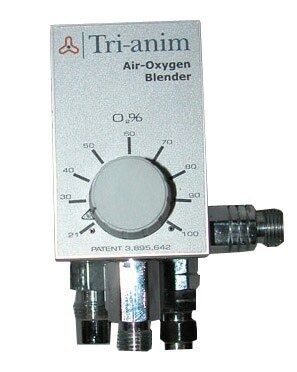 The large selection knob makes oxygen percentages easy to adjust, as well as maintaining percentage accuracy. Flow capacity ranges from low to high at 2-120 liters per minute. This piece of respiratory equipment has bottom outlets that are suitable for ventilators or h-flo CPAP (continuous positive Airway pressure) and a side outlet for flowmeter. With Med One Capital, we come up with innovative ways to make medical equipment available through flexible finance, rental, and sales solutions. This allows you to have access to the best medical equipment and supplies available.